I was tagged by Stefanie at Ni Hao Y'all. I have been following Stefanie's blog for a few months now. I started just before we went to China to bring Sophie Wei home when I found her blog. She is sweet, a great Mom and Wife, has a sense of humor and shares so much. She is one of the reasons why I would rather read blogs than watch T.V. Since I am finally catching up at home I can now enjoy some fun blogging things. Since I am so behind here is a link to Stefanie's blog entry about Tag Your It. I am suppose to list ten Weird Habits and Interesting Idiosyncrasies. Definition of Idiosyncrasies. A characteristic, habit, mannerism, or the like, that is peculiar to an individual. The physical constitution peculiar to an individual. 1. When I work out I always have my hair up in a pony tail. I have never understood how people can play sports or work out with their hair in their face or when their hair is all sweaty stuck to the back of the neck. I can't stand that. It also drives me crazy when playing basketball with someone when all of a sudden their hair wakes you in the eye!! I feel the same way about finger nails. When playing sports like basketball they should be trimmed short so it does not draw blood. 2. During the winter I most always wear a sweatshirt. This way I can take it off when I am hot, when I am cold I put it back on. 3. I usually call people by their last name. Comes from when I was on a teams, when I coached. Usually people do not have the same last name so it is easier to tell people apart by their last names. Also because of teaching so many children it is easier to tell them apart by knowing their last name although I am way behind on this task this year since I am just back to work so I have a lot of work to do before report card time. 4. When things need to go up stairs I pile them on the stairs and carry them up when I go up stairs. My hubby does not like it that I do it but it saves me trips from going up and down. 5. I usually have fun fixing Simone and Sophie Wei's hair every day and enjoy helping them pick out matching hair pretties. Simone is getting to the point where she does not like to have her hair fixed so I usually just follow her lead now. Since I am back at work I have not been fixing their hair too much because Rick gives them a bath in the morning after I leave so it can help Sophie Wei's muscles, etc. 6. I always wear a necklace and earrings....I always wear my watch during the work week and go with out it on the weekends. 7. When I wash my face at night I always get tons of water on the counter around the sink so I have to clean it up. When I was in college it use to drive my room mate Windy crazy because I use to also do it around the kitchen sink. 8. Now that I have my first pair of "expensive" eye glasses I always have to put them away their hard case. Since I have bad eyes (left eye -6.5 and right eye -7.0) I ordered light weight lenses, polished lenses and rounded corners! 9. Most nights I have to read before I go to bed so I can settle in. I usually am reading books that have to do with the season of life I am in at the Moment or for fun. Now I am reading a book that I received from my friend Andrea M. called Jazz Notes by Don Miller. Here is a description from Amazon: Jazz Notes captures the essential Don Miller with non-religious reflections on how Don's incredible spiritual odyssey got started; what happened to Don at one of the most liberal colleges in the world to help him experience faith and grace for the first time in his life; a recasting of Don's marvelous "confession booth" story; and how Don discovered the secret to really loving other people-and himself. 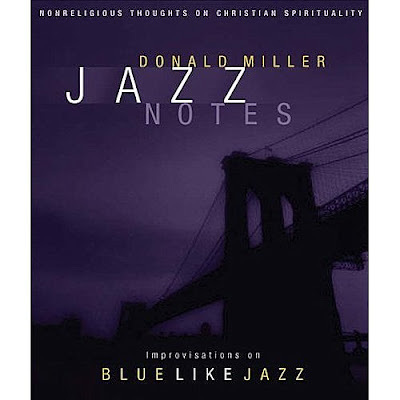 Jazz Notes includes a bonus audio CD with Don Miller interview. 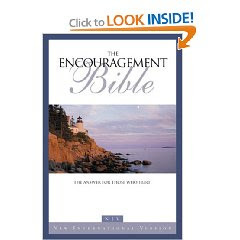 Another book I am reading is called the Encouragement Bible. Here is the description about it from Amazon: When your world is caving in, the NIV Encouragement Bible meets you where you are. And it takes you where you most need to be: into the presence of God, who alone can give you comfort, reassurance, and strength. The NIV Encouragement Bible does more than offer answers. It guides you to the one Answer who can truly satisfy--God himself, who knows you completely and loves you beyond what you can imagine. 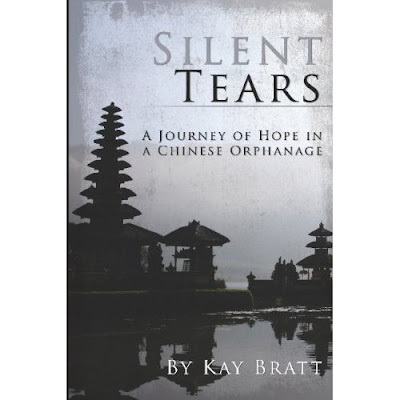 The other book that I am reading is Silent Tears by Kay Bratt. I am always reading some thing about China. It usually is some thing to do with Chinese Adoption, Cooking, Travel, History or Traditions. Here is a link to her blog. Here is the description from Amazon: An American volunteer in a Chinese orphanage learns to pull from the hidden strength within her to improve conditions for the children. If you have ever wondered what day to day life is like in a Chinese orphanage, this will tell it. If you have ever wondered what it is like to love a child so deeply, even though they aren't yours, this will tell it. If you have ever wondered what it would be like to move to a different country, this will tell it. 10. I enjoy blogging about our family, creating an instant scrapbook with journeling not needed to be done like most of my scrapbooks. Although I still do enjoy scrap booking small themed albums I prefer to blog. I still need to publish my first Blurb book thanks to my friend Kara for helping me!! I have also decided to change our blog photo header more often. Right now I am going to go through photos from our trip to China in June of 2008 when we brought Sophie Wei home. We took so many photos that I feel that we have not really been able to enjoy them all. This photo below is of when we were very hot and enjoying a tour a Museum.